Welcome, and welcome back, Fordies! Good morning! I write with great excitement to greet and welcome our community as we officially launch the 2018-2019 academic year. To our new students, faculty, and staff, I’m confident that you’ve received a warm welcome and are prepared for success in your classes and work. To returning members of our community, you’ll find some changes to campus (classes now start at the advertised time!) and some traditions that will never change (optimism and angst about the football team’s chances). Every fall is exciting on a college campus, with new friends, lessons, and adventures in the air. But I dare say this fall, here at the Ford School, is something special: there’s so much energy and excitement about the Ford School’s work and its role within the University. For example, with funding support from donors and from the University, we’re launching exciting new programs in practical policy engagement and in listening and learning across differences. We’re starting the third year of our strategic plan around diversity, equity, and inclusion. We have world-class new faculty and distinguished policy visitors; please see this news item for full details on faculty appointments and promotions. We’ll be launching a powerhouse new Master of Public Affairs degree program. We’re hosting a terrific lineup of events. And we have another exciting initiative to announce just around the corner…. Please come and learn more about all of that good news tomorrow, September 5 at 4:00 pm in the Annenberg for the Ford School Fall Launch: All-School Assembly & Ice Cream Social. I’ll describe some of the things I’m so excited about, and then we’ll have a good old-fashioned ice cream social—featuring faculty and staff scoopers! We welcome 80 new bachelors of public policy students this fall. Forty percent are Michigan residents and 28% are students of color. These students are already leaders within networks and groups from all over campus; now, they’ll become an integral part of the Ford School community as well, and their ideas and energy will be a force for good. One hundred and sixteen new master's students join the school, 107 MPP and 9 MPA. Ninety-seven of them are U.S. citizens or permanent residents, and 19 are international students--hailing from 10 different countries and 3 continents. Our domestic students come from 18 different states plus Washington, D.C. Forty-one are Michigan residents, 36 are people of color, 27 are first-generation students, and their average age is 27. Another excellent, very promising cohort of PhD students joins us as well. They include two students pursuing joint degrees in economics, two in political science, and two in sociology. Collectively, our new students are mission-driven people who have come to the Ford School wanting to change the world for the better. Welcome! I am eager to get to know each of you, and learn why you are here and where you want to go next. This year is a mid-term election. Each of us is here at the Ford School because we’re committed to improving our communities and our world. Participation in the public policy process at the local, state, and federal levels is core to that commitment, and it all starts with voting. I encourage every eligible student, faculty, and staff member, of any political persuasion, to register to vote and to sign up for TurboVote, a nonpartisan website that provides information and resources about voter registration, upcoming elections, absentee ballots, and more. The Ford School has launched a challenge to achieve at least a 90% TurboVote sign up rate of eligible members of the Ford School community. In fact, we’ve issued a friendly, civic-minded challenge to all other schools on campus and all public policy schools around the country: which school can achieve the highest TurboVote sign up rate? Let’s get the Ford School to the top of that list! Here’s the link. All members of our community can participate in this effort, regardless of their eligibility to vote in U.S. elections. Anyone can staff signup tables and encourage their friends to register and vote. To get involved in the school’s efforts or the Voting Challenge effort more broadly, you can contact Ford School student Zoha Qureshi (qureshiz@umich.edu) or Logan Woods (ltwoods@umich.edu), Secretary of Turn Up Turnout. Why do we vote? Why did we choose to study, teach, and make a difference in the field of public policy? How do we do our work? And for whom? It’s all about our mission. Many students, faculty, alumni, Ford School friends and supporters, and staff worked and provided input over the past several months to articulate and refine the Ford School’s mission statement and core values. I’m proud to share with you the results of that work. 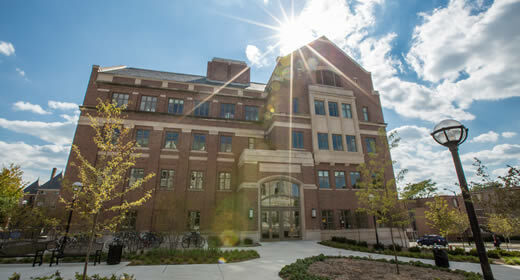 The Ford School at the University of Michigan is a community dedicated to the public good. We inspire and prepare diverse leaders grounded in service, conduct transformational research, and collaborate on evidence-based policymaking to take on our communities' and our world's most pressing challenges. We value community, integrity, respect, service, inclusion, diversity, and equity. We aspire for our work to be excellent, relevant, rigorous, collaborative, engaged, and impactful. You’ll find our mission and values on display in several languages along the 2nd-floor hallway. And most importantly, you’ll find them in our work and in our aspirations as members of the Ford School community. Welcome, and welcome back to Weill Hall. Let’s get to work!